This was the first day back for seminary since our week of spring break vacation. Coming on the tail of General Conference and hearing the prophet and others speak, I chose to finish my presentation (that we as seminary teachers have been asked to do off and on throughout the year) regarding the prophet Joseph Smith. We talked about how, because of Joseph Smith’s valor, we now have so many things and that they as students would now be able to explore some of those things. We first went to D&C 135:3 and I asked them to underline the achievements listed in that verse. Then I distributed stories from pages 10-15 in The Prophet Joseph Smith Bicentennial: Teacher’s Guide. Each student received a copy of one or two of those stories to ponder and then summarize for the class. Once they were done individually reading their stories, they also were to think about the traits of Joseph Smith they’d learned about from the account. Then they were to write that on slips of paper. Each student received two slips of paper, thus they were to think of two traits the Prophet had. As a class then, we discussed specifically why it has been said that Joseph Smith lived great and died great. Each students summarized in their own words the story or stories they’d received, and then they showed the class the traits they’d written on their slip of paper. 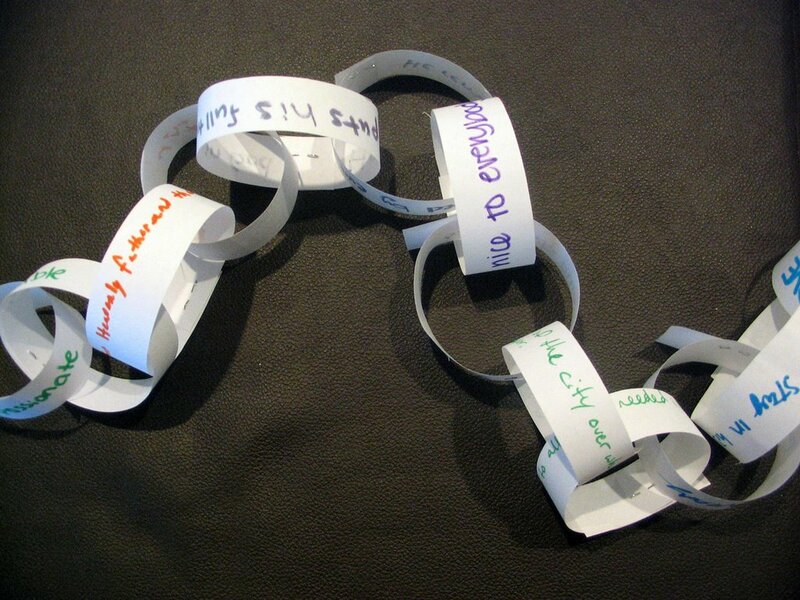 As each one shared, I stapled their paper slips together to create an ever-increasing chain of demonstrated faith and strength by the Prophet Joseph Smith. Then to finish it all off, I read the quote from President Hinckley on page 16 from the same manual. President Hinckley in that quote shares his testimony and the things we have to thank the Prophet Joseph Smith for. Just prior to reading that quote, I had asked the students to think while I read the quote on what they were most grateful for, of all the things Joseph Smith had brought about. We then had some quiet contemplation time while they recorded those things in their journals. There was a sweet spirit of peace as we finished the lesson today. just another-early-morning-seminary-teacher mom! :0)Free resources for the LDS seminary teacher.